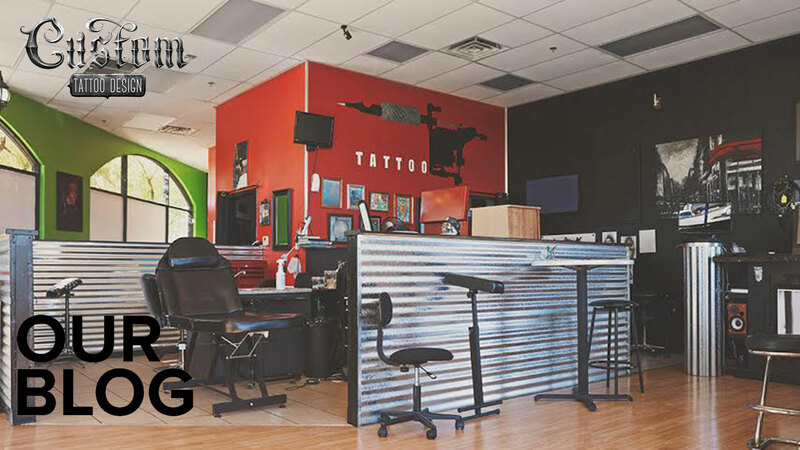 A relatively modern design type is the scientific tattoo. These designs feature anything from microscopic biological structures, to macroscopic space objects. Many of them are readable and minimalistic, clearly displaying scientific laws or concepts in special scientific notation. 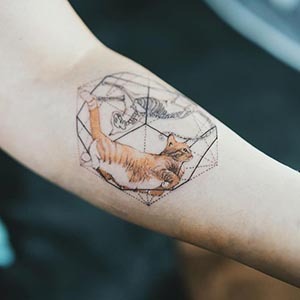 The specific ‘meanings’ behind these designs are straightforward, as far as the actual scientific concepts are concerned, but the meaning behind the tattoo tends to be highly personal. Popular science writer, Carl Zimmer, set out to learn about those who had science-themed tattoos. 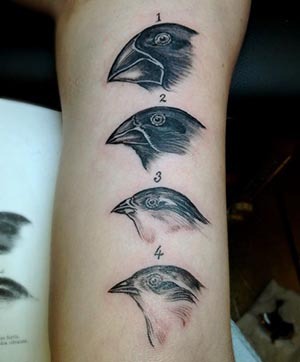 He discovered that many people working in a scientific field had a related tattoo based on an emotional connection they’d made to a certain scientific idea. 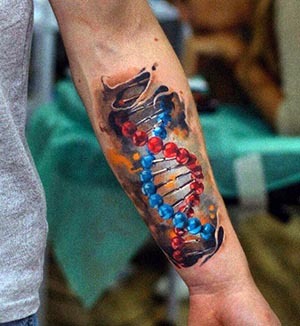 Others have opted for scientific tattoos simply to express their passion for the subject. 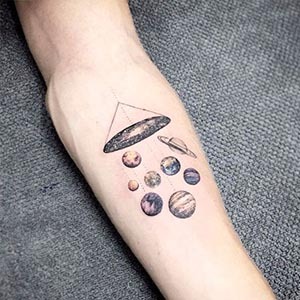 Look through our science tattoo dictionary below, and see if any of these ideas appeal to you! Amino Acid Sequence: a biological compound that makes up the DNA sequence and proteins. 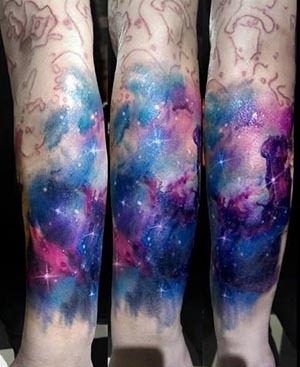 People opt for tattoos of amino acid sequences as a reminder that they’re made of ‘star stuff,’ or the same matter as stars. Anatomical Heart: a human heart depicted as it would realistically look inside your body. 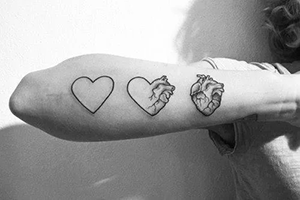 Much like the simplified heart designs (or love hearts for our Aussie pals), anatomical hearts commonly represent love, passion, and empathy. Darwin’s Finch Sketches: these are an exact replica of Darwin’s original observational sketches of finches. Those who admire Darwin’s work on evolutionary theory might opt for this unique design. DNA Helix: a 3-dimensional ladder-like structure that holds all of a human’s genetic information. The DNA helix can be symbolic of one’s individuality and uniqueness. Dopamine: a neurotransmitter most popularly known for its role in reward-motivated behavior. Those who choose a dopamine molecule design may use this symbol as a reminder of their motivations. 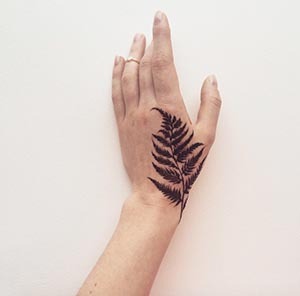 Ferns: a common plant in New Zealand, the fern is a symbol for resilience and virility. This plant has existed for millions of years, and it has an impressive ability to thrive. Golden Ratio Diagram: represented by a mapped spiral in a rectangle, showing the ‘ideal ratio’ of length to width. This design symbolizes beauty and the intricate order of nature. Nebulas: an interstellar cloud filled with ionized gases in outer space. 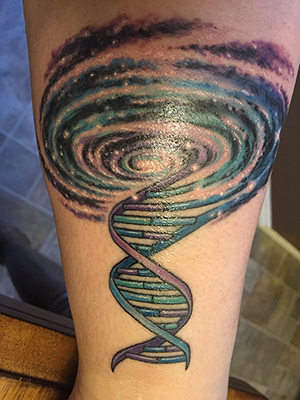 These science-themed tattoos are distinct due to their larger size and colorful makeup. They can serve as a reminder of the universe’s mystery and grandeur. Neuron: a brain cell with a unique elongated structure for sending and receiving electrical impulses. 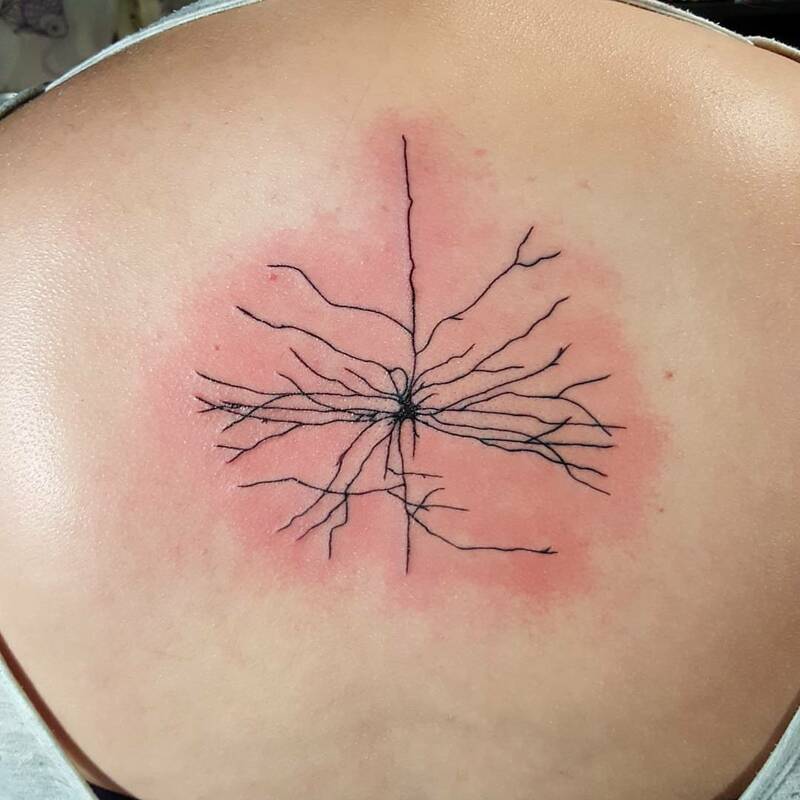 A neuron tattoo often symbolizes the impressive power of the mind. Pi: a mathematical constant, represented by 3.14. 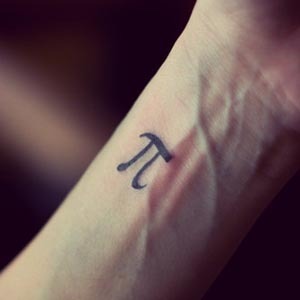 A pi symbol tattoo may stand for nature’s infinite complexity. Schrodinger’s Cat: a visual diagram that shows a cat as dead and alive, to illustrate the Uncertainty Principle in physics. This tattoo may symbolize the mystique of nature. Serotonin: a neurotransmitter most commonly known for its role in mood-regulation. 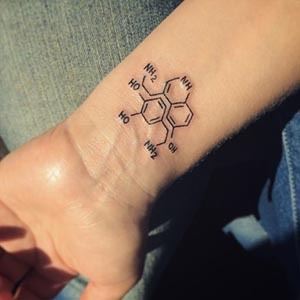 Those with a serotonin tattoo may have it as a reminder to stay happy. Solar System Planets: a visual diagram that shows all of the solar system planets in orbit around the sun. This image represents the progress of human knowledge, and it serves as a reminder that we are part of a bigger picture. 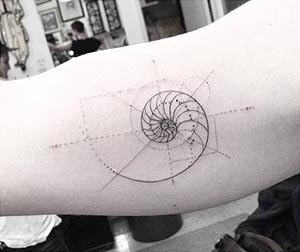 These are just a few science themed tattoo designs out there. Have any favorites? Leave a comment and let us know!